Valpolicella is one of the loveliest wine regions in Italy and home to the famed Amarone wines. Located just northwest of the historic city of Verona and east of Lake Garda, Valpolicella is surprisingly untouched by tourists and offers a treasure trove of wine hamlets and architectural gems for foodies and culture vultures. Apart from expansive vineyards, the region is home to acres and acres of cherry trees, peaches, and apricots, and in season the scenery is delightful. Fine wine has been produced here since Roman times (Verona was a major hub in Ancient Roman civilization, home to a spectacular amphitheater which has survived millennia) and indeed the name is of ancient origin- Valpolicella comes from “Vallis Polis Cellae” which means “valley of many cellars”. This one-day Wine Tour of the Valpolicella vineyards can begin in Verona or Lake Garda, or even Venice (although Prosecco is a closer day trip from Venice). The tour is with your own private chauffeur and takes in two contrasting wineries, which could include Allegrini, Villa Monteleone, Ca Rugate, among many other high-end small estates. You will visit the cellars and vineyards and learn about the fascinating heavy work intensive production of the Amarone wines, as well as the sweeter Reciotos. Indulge in a leisurely four-course Italian lunch, paired with various local wines, and in the afternoon on the way back to Verona, stop to stretch your legs in a picturesque hamlet. This is a fantastic full day wine tour for guests looking for special VIP treatment and an introduction to some of the best Amarone wines in the Valpolicella. In the morning, your own private chauffeured Mercedes will collect you from your Verona hotel and sweep you away to the lovely Valpolicella wine country. First stop is to a top wine producer such as Allegrini in Fumane di Valpolicella. Enjoy a VIP visit and tasting of their superb wines such as the cult La Poja wine. Lunch will follow and is an authentic and charming affair, with typical dishes such as “Sformatino di Formaggio Monte Veronese con Funghi e speck d’anatra” (Cheese savory custard with mushrooms and cured duck), Risotto all’Amarone, Brasato di Manzo all’ Amarone con polenta (beef slow cooked in wine, served over polenta), all paired with Valpolicella Classico Superiore, Amarone of course and Recioto Della Valpolicella. Stunning regional cuisine and you won’t be hungry for dinner tonight! 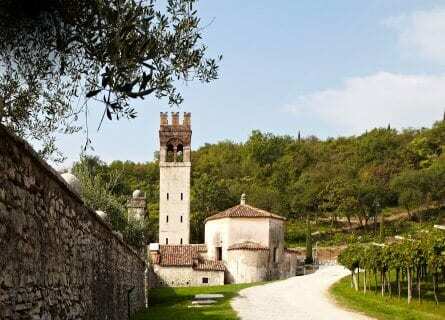 After lunch visit a boutique estate such as Villa Monteleone in Gargagnago, also famous for being the home of Dante Alighieri, Italy’s most famous poet, and playwright. The property houses a small winery, with a charming garden and a pretty tasting room in the house. In this very cozy atmosphere, you will taste signature wines like the Valpolicella Classico, Valpolicella Classico Superiore, Amarone, Recioto, Amarone “Riserva” all served with some local cheeses. On the way back to Verona, depending on your interests, we can arrange a nice place to stop off and take in a walk and take some photos. It was very smooth and professional. Both wineries were beautiful and interesting, and different. I’m glad we only did two and had a driver – the amount of wine given was quite generous and it would have been hard to drink much more wine! Would recommend this tour.